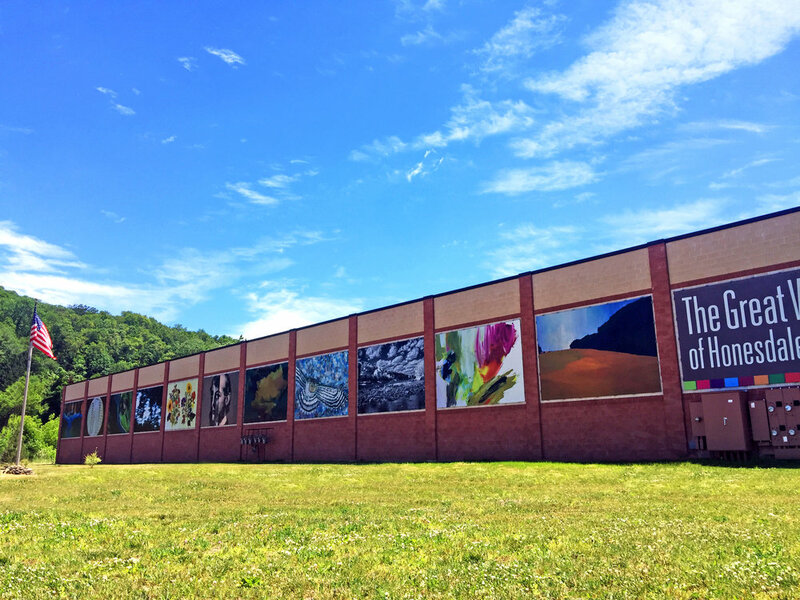 The Project: The Great Wall of Honesdale is a Wayne County Arts Alliance outdoor art exhibition program that exhibits reproductions of original artwork on a yearly basis. The exhibit changes yearly and runs from May to April. The Artists: Are those individuals whose vision has enabled the Great Wall to be. The Wall: Belongs to Top Notch Distributors. The Great Wall of Honesdale wouldn’t exist without their generosity. The Contractor: Is the Wayne County Arts Alliance, who believes that art can inspire us all. The Builders: This group has pulled everything together to make the Great Wall happen. The Framers: Made a one time donation of $1,100 to purchase the metal frames that are mounted on the wall which hold the artwork. The Patrons: Donated $250 to assist with the fabrication and installation of the artwork. The Supporters: Donated to support the artists and the production of this years vinyls. We believe our community is enhanced when people have access to art. If you believe in this as well, we welcome your membership. To learn more about the WCAA, please visit us at waynecountyartsalliance.org.